I’ve never read the Bible all the way through. Sure, I’ve read parts of it – Genesis, Exodus, the Gospels, Acts, Revelation, and others. I’ve read about it endlessly, heard countless sermons, had countless discussions. But I’ve never sat down and gone cover to cover. Really, this is odd. I was raised Christian. My wife and my best friends are Christian. I find the Bible fascinating culturally, historically, theologically, philosophically, symbolically, and linguistically. It is unquestionably the foundation of Western literature. And I love books the way some people love Monday Night Football. This gap in my reading is especially awkward when you consider that I have read core texts of three other religions: Islam (Quran), Taoism (Tao Te Ching), and Hinduism (Bhagavad Gita). Although, to be fair, the Quran and the Bhagavad Gita are both much, much shorter than the Bible, and the Tao Te Ching makes the Nancy Drew mysteries look wordy. I’ve long felt this was a project I ought to tackle, but the time never seemed right. Lately, though, as I’ve been doing research for The Crane Girl – which is heavily steeped in religious symbolism – it’s been growing ever more apparent that, if I’m going to do it, I should do it now. I asked Betsy if she’d be up for taking the challenge with me, and she agreed. So we’re doing a chapter a day – a slow but sustainable pace, ideal for both of us, that will have us turning the final page in about three years. The translation is the New Revised Standard Version (NRSV). 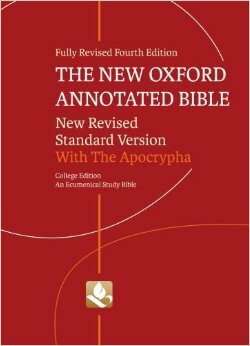 More than just a translation, however, this is the New Oxford Annotated Bible (fourth edition) – a study Bible designed for close, critical reading, complete with introductions for each book, copious footnotes, maps, family trees, alternate translations, and so on. You’ll notice the cover says “With The Apocrypha.” As used here, “apocrypha” is a broad and non-derogatory term that covers all the books that are in the Catholic Bible but not the Protestant (like Tobit, Wisdom of Solomon, 1 & 2 Maccabees) and books from that belong to the eastern Christian canon but not to the Protestant or Catholic canons (like 1 Esdras and 3 Maccabees). The idea is simply to read the entire Bible, broadly understood, rather than the Bible of any particular group. How do I approach a task like this? How should I read? In general, I want to be both critical and open. Critical, because this is an extraordinarily difficult and complicated text, used for moral and spiritual guidance by over two billion people. Such a work deserves serious analysis if it’s written by humans alone, and even more so if written by God. Open, because there’s a lot to be learned from the Bible, and not just academically. I can’t imagine anyone seriously arguing otherwise. Yes, there are parts that I think are ugly, wrong, and evil. But there are other parts that are beautiful, profound, and enlightening. I’m not Christian, and I don’t expect to be converted by this reading, but it would be foolish to shut any door permanently. I believe I have a soul. Not necessarily an immortal soul, or a soul independent of the physical brain, or anything mystical per se; but certainly there is something inside me, inside everyone, with the capacity to reach upward, no matter what we may find there. Why not give it a chance to grow? I’ll be posting my thoughts as I read, Postmortem-style: the good, the bad, and the curious. These posts can be simple one-way lectures if you like, but I’d much rather they be discussions. Comments, as always, are welcome. Here’s hoping we make it past Exodus! I’m modifying my python script to pull down NRSVCE, NIV and WEB from Bible Gateway as we speak. I’m so glad I’ve got someone else who’s a Bible reader and computer programmer. You understand how I think. I’ve already begun applying game theory to the Garden of Eden (no joke). You’ll have to tell me about that one. That sounds interesting. Very interesting project. My detective character is an ardent atheist, and she is disdainful about the idea of reading the Bible. I’ve always thought that her attitude reflects her youth, since, as you say, there are many possible reasons to read it besides belief in its contents. Okay, maybe not a perfect analogy. 🙂 But you know what I mean.